Not only did Noah curse Canaan, but he blessed Shem and Japheth. I’m sure that didn’t go over well at family gatherings. Noah’s descendants kept moving east (Genesis 11:3)—hopefully, you are noticing a trend by now—the farther we move from God, the easier it is to sin. At one time, everyone in the world spoke the same language, and they eventually settled in the land of Babylonia (Genesis 11:1–2). However, bad habits die hard and the sin of pride and rebellion once again rose-up in the people. The people wanted to make themselves famous. Sounds very similar to the fame and power Lucifer wanted, too. The people began to build a tower that shot straight up into the sky toward heaven. This time, God went down from heaven with His angelic force, confused the people with different languages, and scattered them all over the world so they would not be able to continue in their self-reliance (Genesis 11:7–8). The people whom God had spared from complete destruction fell into a lifestyle of sin and estrangement from God just as all the others had before them. God had another solution for these wayward people. He was about to call a spiritual father for these spiritual orphans. His name was Abram. Abram was from the lineage of Noah’s son, Shem. He was the son of Tehar. Abram lived in the land full of people doing life far from God. But God was about to move Abram and set him on the path to his purpose. We don’t know much about Abram, but we know his family was into idol worship. As people moved farther from the presence of God, their need for new gods increased because if God wasn’t their priority, they were going to need to seek assistance from somewhere else. God knew Abram would be distracted by the culture, so He told Abram to move. God chose this man, Abram, to be the father of many nations. The spiritual tone Abram set would determine the culture of the future generations of God’s chosen people. Would it be possible for one man, and one woman, to parent these ungodly people? Apart from God, no. With God, anything is possible. Abram wasn’t perfect, but God is a God of covenant. Just as with Noah, God kept His covenant despite the fact His people always returned to sin. God told Abram that nations would be born from him and that is exactly what happened. Were the nations perfect? Unfortunately, no. What could have possibly made it different? Volume. There is power in multiplication. One becomes three, three becomes eight, eight becomes seventeen…and so on. Father Abraham couldn’t do it all by himself. He needed others who would also make the decision to do what was right in the sight of the Lord. Their right living would become an example to others to live rightly. If sin can be duplicated so too can right living. Do you ever have self-righteous conversations with your Bible when you are reading it? I hope I’m not the only one. Sometimes I find myself saying things like, “Good grief. What will it take to convince you people to do the right thing?” or “How could you miss it? You saw the glory of God on the mountain and yet, you were down below wrapped in sin. What is wrong with you people?” It’s in those moments when I think, or mumble, those words that a spirit of conviction and grief well up in my heart. I was that person. We are that people. We live out our days under the shadow of the Cross and the rolled-away stone, and yet, we are no better than those who tossed their jewelry into the fire and worshiped the golden calf that emerged from the fire (Exodus 32). I can only imagine how Moses must have felt when he threw down the stone tablets during his holy temper tantrum. Why was Moses so angry? Because before Moses went down from the mountain, he pleaded with God on the people’s behalf (Exodus 32:11–14). He begged God not to destroy the people. We are sort of like that today. If we pray, we pray for people to change, but the minute we see that no change has taken place, we get angry and throw temper tantrums. We sometimes withhold our grace and instead replace it with judgment and anger. What right do we have to do this? Absolutely none. God gets to choose whom He wants to spare and forgive. He’s the only one righteous enough to fulfill this role. 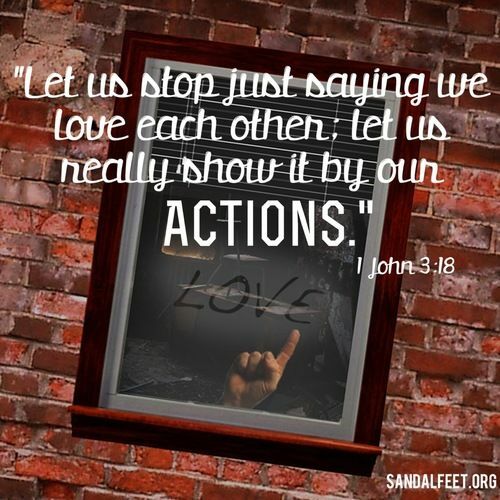 All God asks us to do is to tell the world about Jesus and allow the Holy Spirit to do the rest. Our sinfulness and need for a Savior should always be at the forefront of our mind. Otherwise, if we forget where we came from, we run into the quicksand of becoming self-righteous like the Pharisees and grace-less. *Excerpt from Erin Olson's upcoming book, Spiritual Orphans: A Generation in Crisis.